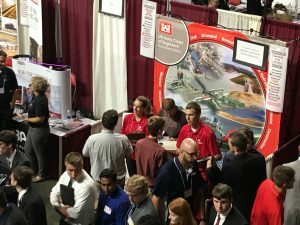 A view of the 2017 ISU Fall Engineering Career Fair in Hilton Coliseum. Photos by Kate Tindall. Following the career fair, you probably contacted employers with thank you emails and constantly gripped your phone in hopes that recruiters would ring with news of an internship or co-op. Now, it’s time to review those notes for potential interviews. Perhaps you need to polish up for the next opportunity? 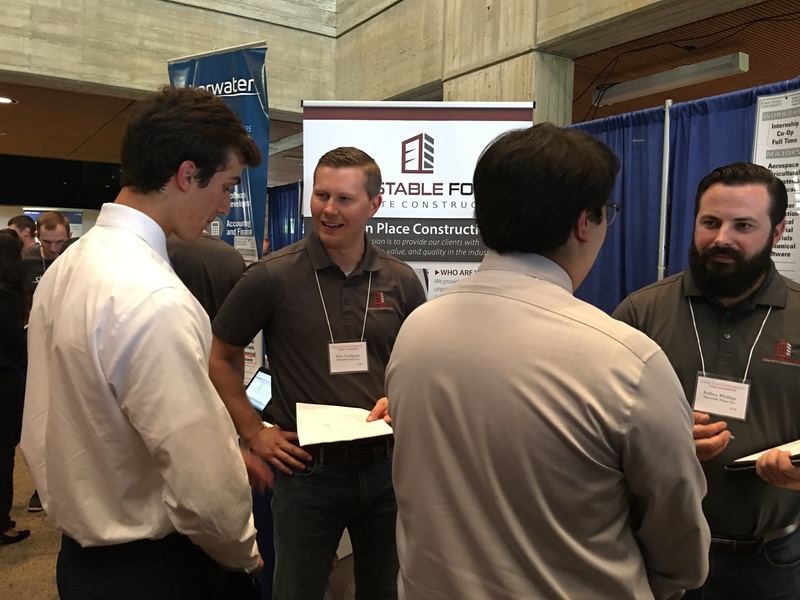 Catch the trends and buzzwords highlighted below from three civil, construction and environmental engineering alums who took time to visit with departmental representatives during the fall career fair. 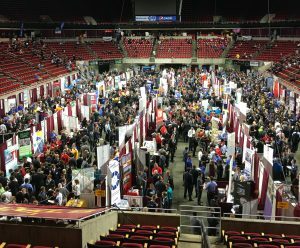 How can students best prepare for the career fair? Eric Lindquist (center left) speaks to an engineering student during the career fair. What qualities or experiences are you looking for in the ideal intern/job candidate? “Communication skills and ability to communicate verbally. Technical skills and electronic communication is a given with the younger generation and engineering grads. We still need soft skills.” –Eric Lindquist, President of Adjustable Forms, Inc.
“Mortenson is always looking for good communicators and problem solvers. While GPA is important, those candidates who can evidence leadership in a variety of situations tend to succeed in both internships and full-time employment. Soft skills are so important in this time of social media. We are still very much a people-based business.”–Troy B. 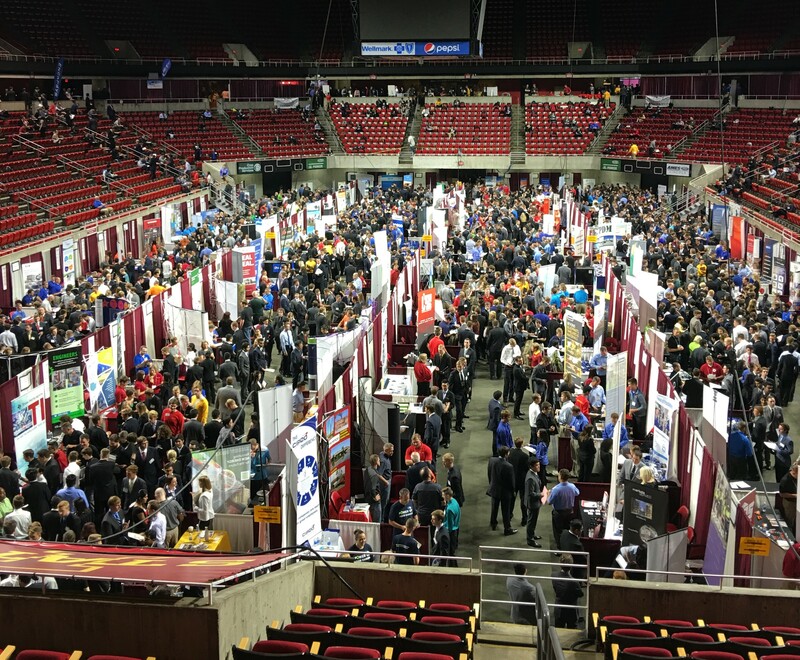 What is the top advice you can give to civil and construction engineering students coming to the career fair? “Be open to anything. You don’t always know what you want to do … Be willing to experience whatever is available, and have different experiences. Be willing to go for the company that offered you an internship that you’re not sure about. Maybe it will turn out that that is exactly where you want to work.” -Rebecca B. Students gather around the Army Corps of Engineers-Rock Island District Booth to talk with representatives. How did your time at ISU better prepare you for your career in engineering? “I involved myself in as many leadership extra-curriculars as I could and focused on taking meaningful electives that prepared me for my career.” -Eric L.
“Don’t say ‘no’ to things. Volunteer. Be a part of a club. Don’t be a student that just does the homework and is done at the end of the day. Be one of those students that makes connections. Go out there and network. If someone asks you to take a leadership position, do it. Just go for it!” -Rebecca B. What is the top thing you would recommend students do prior to graduating from ISU to be a successful engineer? “Internships and involvement in organizations. Spending multiple summers (or a co-op) learning about the business and learning about one’s own interest is the best training in the world. While at school – prove you can learn, and get involved.” -Troy B. “While the job market is currently very strong and opportunities are plentiful, the economy is cyclical. Graduates should do everything they can to position their careers for long-term success. 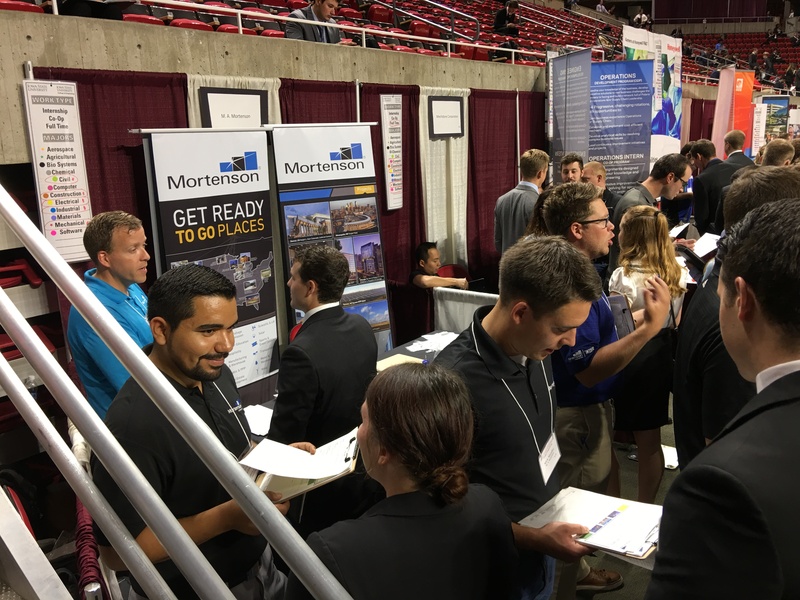 No matter the skill set or talent level, hard work usually prevails.”-Eric L.
Recruiters from Mortenson talk with students and view resumes. Interested in the latest industry insights? Follow ISU CCEE on Facebook, Twitter and LinkedIn (Iowa State University Civil, Construction and Environmental Engineering and ISUConE) for more tips from alumni leaders.